The Egyptian armies of the Old Kingdom (c.2649—2134BC) and Middle Kingdom (c.2040—1640BC) fought primarily on foot and in massed ranks. Their soldiers were lightly equipped with shield, bow, spear and axe. The constant wars and invasions of the later dynasties brought with them the assimilation and transference of diverse military technologies. This greatly expanded their range of weapons, which diversified to include plate armor, chariots and, more importantly, the sword. Following the collapse of central government in Egypt due to internal rebellion, the Hyksos peoples of Palestine took advantage of this instability and invaded Egypt around 1640BC. They ruled Egypt for over 200 years and brought with them striking advances in weapon making, particularly the use of metal in the manufacture of swords and edged weapons. The adoption of the sword in ancient Egypt was a direct consequence of the introduction of metal. Prior to this, axes and spears were fashioned from flint, and swords were simply not available. Copper had already been utilized for some time, but bronze was the first material consistently used for sword blades, as it was much harder and easier to work. Sickle-shaped swords (originally inherited from the Sumerians) were gradually replaced by swords with slightly curving blades. 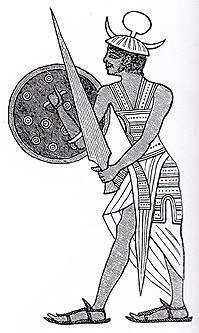 The “Sea Peoples”, invaders from the Aegean and Asia Minor who first attacked Egypt during the reign of Merenptah (1213—1202BC), also introduced straight, two-edged blades with sharp, stabbing points. Contemporary depictions of battles show massed infantry using both jabbing and slashing swords. Throughout the Mediterranean during the New Kingdom period of Rameses III (c.1186—1155BC), the smelting of iron ore had a direct impact on Egypt, enabling swords to be produced with much longer and sturdier blades. Examples of swords with blade lengths of up to 75cm (30in) have been unearthed from royal tombs. This ancient Egyptian warrior is depicted carrying a long, double-edged and broadbladed sword. It is probably a one-piece construction. Primarily a weapon used for hunting, the Egyptian spear never surpassed the bow and arrow, which remained the standard weapon of the Egyptian Army. During the Old Kingdom (c.2649—2134BC) and Middle Kingdom (c.2040—1640BC), simple pointed spearheads were constructed from either flint or copper and attached to long wooden shafts by means of a tang (the hidden portion or “tongue” of a blade running through the handle). In the later New Kingdom (c.1550—l070BC), stronger bronze blades were secured by a more reliable socket. Behold His Majesty was armed with his weapons and His Majesty fought like Set in his hour. They gave way when His Majesty looked at one of them, and they fled. His Majesty took all their goods himself with his spear... Karnak Stele of Amenhotep II, from W.M. Flanders Petrie, A History of Egypt, Part Two. 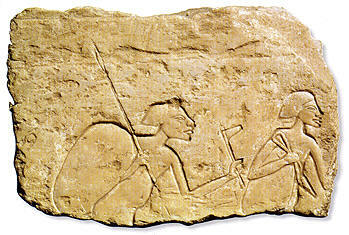 ABOVE: Carved by an unknown Egyptian artist during the 18th Dynasty, c.1567—1320BC, this relief depicts two soldiers, one carrying a spear. ABOVE: An Egyptian bronze khepesh sword with a handle inlaid with ivory. The sword comes from El Ivory handle Rabata and dates to the New Kingdom, c.1250BC. Originally a throwing weapon of sickle-sword shape, the khepesh could also be used as a conventional slashing or cutting sword. It appears to have been a favored weapon of the Pharaoh, as he is often depicted wielding it against enemies or during a hunt. The discovery of the tomb of Tutankhamun (r.c.1361—1352Bc) by Howard Carter in 1922 revealed remarkable insights into the lives of ancient Egyptians. One of the numerous objects found in the tomb included a ceremonial shield, which depicted the young Pharaoh “smiting a lion” with a khepesh. 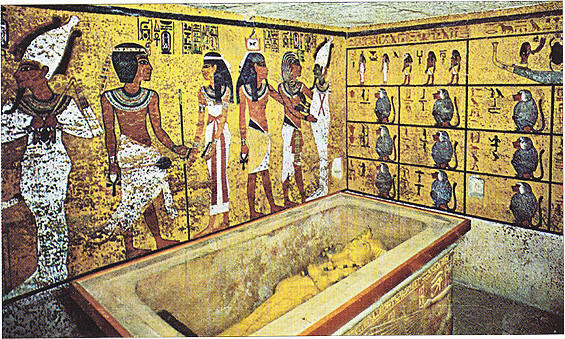 ABOVE: The Tomb of Tutankhamun. The king is depicted in a number of battle scenes, although it is not known whether he actually took part in any campaigns. There were two distinct types of battle-axe used by the Egyptian soldier: the cutting axe and the piercing axe. The cutting axe, used during the early kingdoms, had a head attached to a long handle and would have been used at arm’s length. The blade head was attached to the handle through a groove and then tightly bound with leather or sinew. This axe was especially effective against opponents who wore little body armor, particularly Egypt’s African enemies, like the Nubians. It was usually deployed after the enemy had been routed (often by the archers), rather than as a weapon against massed ranks. The cutting axe was later superseded by the piercing axe that was designed to penetrate armor. Unlike contemporary Asiatic societies (especially the Sumerians and the Assyrians), who used a blade cast with a hole through which the handle was inserted and firmly attached by rivets, the Egyptians continued to use the antiquated method of a mortise-and-tenon joint (a tenon is a tongue that slots into a hole called the mortise) to fix the blade to the handle. This made the battle-axe inherently weaker. During the invasion by the Hyksos around 1640Bc, this obsolete weaponry, coupled with the invaders’ use of horse-drawn chariots, long swords and stronger bows, proved fatal for the lightly armed Egyptians. 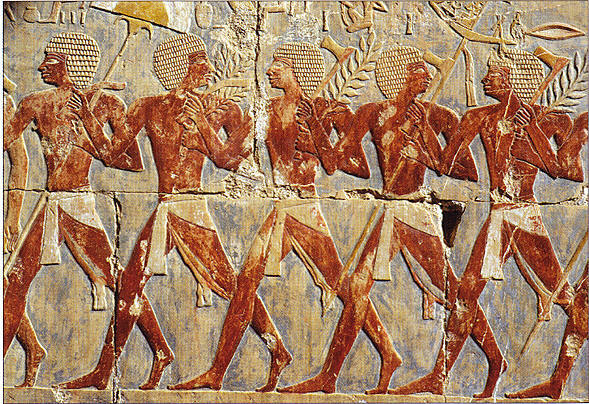 ABOVE A painted relief of light infantry with standards, battle-axes and palm fronds, from the temple of Hatshepsut in Thebes, Egypt, c.1480BC.